I Want to Start a Coin Collection. What Do I Need? Anyone considering the notion of taking up the fascinating hobby of collecting coins requires the essential coin collecting tools and supplies to properly store and display their coin collection. Above all, these coin supplies ensure your coins are safely kept from any type of damage, and in as perfect condition as possible. The following outline is a fundamental listing of the primary coin tools and supplies that will get you off on a good start toward a richly rewarding and lifelong hobby that will not only offer you countless hours of enjoyment, but the beginnings of a legacy you can share with family, friends, and fellow enthusiasts for a lifetime. The only way to effectively view your coins will require a good light source and a magnifier to provide the optimal conditions for inspection. The most advantageous lighting is an incandescent bulb. Fluorescent lighting is usually too soft and inadequate, and could hide the more significant characteristics and imperfections from scrutiny. Halogen lighting, by contrast, is considered too harsh and will also reveal minor or trivial blemishes on your coin. A basic and inexpensive desk lamp with a 75 watt incandescent bulb works quite well for coin examination. 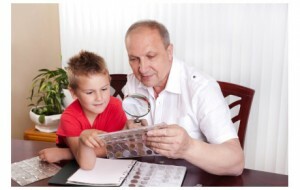 It is recommended that you have two types of magnifiers available. The first is an ordinary hand-held lens, typically 1.5” to 4” inches in diameter, with a magnification power between 2X to 3X. This is perfect for general viewing purposes, as well as appraising the coin’s overall condition, attractiveness and eye-appeal. Close-up examination of the surface a coin will require a jeweler’s loupe, with a magnification power between 10X and 15X. Gloves may be one of the most important, must-have tools in your coin collecting arsenal. Coins surfaces are extremely delicate, and the oils and acids from your hands can easily and often irreparably damage them. This is even more critical when handling your uncirculated coins with immaculate surfaces. To keep from contaminating your coins, wearing gloves is essential for maximum coin protection. Gloves made of a soft cotton material are ideal and recommended by many professional numismatists and collectors. Good alternate choices to cotton gloves are the powder-free latex or nitrile gloves, along with finger cots, that can be found at any neighborhood drugstore or coin supply site. Coins are often scratched or damaged when dropped onto hard surfaces. A good measure of precaution would be to examine your coins on a soft pad or cloth to cushion your coin. The pad will also keep your coin from rolling or sliding which causes further damage. There are two books that are essential resources for any beginning collector. The first is the U.S. Coins ‘Red Book’ – A Guide Book of United States Coins. The second important resource is the Official American Numismatic Association Grading Standards of United States Coins (ANA Grading Guide). The Red Book is the official pricing guide for United States coin mintages, and includes brief histories and descriptions of all the U.S. coins ever produced. The ANA Grading Guide provides a detailed description of every U.S. coin and how a coin’s grade is determined. Another vital coin collecting necessity is a safe and secure method to store your coins. Most beginners start with the usual ‘cigar box’ as a convenient and inexpensive coin storage device. Unfortunately, damage to your coins can occur from touching, sliding, and rubbing against each one other. Therefore, the best types of coin holders are those that are specifically designed to contain your coins in a secure manner. There are numerous coin containment types available on the market. These include anything from paper envelopes, plastic coin bags, cardboard 2x2s, vinyl 2x2s or ‘flips’, and plastic coin tubes, to hard plastic coin holders, and slabs. The most popular and least expensive coin holders are the cardboard 2x2s, which are 2″ x 4″ pieces of cardboard, with a hole cut in the middle of each side, and clear Mylar plastic fixed to the inside. The coin is secured by placing it on the plastic, centered over the hole, and the holder is then folded in half and stapled closed.It is also important that you buy a ‘flat clinch’ stapler that presses the staple underneath the holder into the cardboard to prevent the staple from protruding from the back of the cardboard holder and damaging any adjacent coins. Equally popular and inexpensive is the coin flip, which is also made from Mylar plastic. They measure 2″ x 4″, designed with a pocket on each side. The coin slides into one pocket, and an identifying card slides into the other pocket. The flip is then folded over to keep the coin from secure, and then permits safe and effective storage in a coin album page or storage box. Be very careful when buying coin flips that they are not made from materials containing PVC. Coin tubes are square or round plastic containers that are used to store coins, and are ideal for storing circulated and ungraded coins that are purchased in sets. They are available in cent, nickel, dime quarter, half dollar, silver dollar, silver round, silver eagle and silver dollar coin denominations. These will also prevent damaging environmental elements away from your coins. There are two other types or styles of great coin holders called Air-Tites – Air-Tite Holders with Rings or the Air-Tite Direct Fit capsule. The Air-Tite coin holder is a two-piece snap together acrylic case comprised of a cover and a base to fully enclose a single coin. In addition, there are snaplock cases, mint and proof set cases, and frosted cases. As your collection grows, and you begin to accumulate more valuable types and mintages of coins, you might consider the coin ‘slab’. For expensive and rare coins, a slabbed coin will surely provide the best form of protection, and is done by a third party grading service, such as the Professional Numismatists Guild (PNG), using an encapsulation process.You have the best coin holder available, the coin’s authenticity is guaranteed, and you have a professional numismatist’s evaluation of the coin’s grade. Another technique of storing your coin collection is a coin folder or coin album. There are many selections and styles you can choose from. The coin folders only permit a single side of the coin to be viewed, and are quite inexpensive and ideal for beginning collectors. Intermediate and advanced collectors may prefer the coin albums that are a bit more expensive, but show both sides of the coin, and provide added protection using plastic inserts that guard both surfaces of a coin. As you gain more experience, the coin collecting supplies you may need will also change. As you advance from collecting coins by date and mint mark to new types like die varieties or error coins, you need to be able to verify a coin’s authenticity. You will require coin collecting tools like a digital scale, digital caliper, stereo microscope, coin tongs, a good digital camera, and some type of coin cataloging software for keeping track of your inventory. Keeping your coins in coin holders and albums is just the first step to coins protection. Where you store your coins is equally important. Along with mishandling, the primary causes of coin damage are humidity, extreme heat or cold, acids, chlorine and air pollution. You will need to take steps to determine where the safest and most secure place to store your coins would be. Another option would be to purchase some type of coin storage box or display case for added security, or more impressive methods to display or present your best specimens.It is also important to remember that wooden book shelves and cabinets can release destructive chemicals into the surrounding environment where your coin collection is stored, such as adhesives, paint, and wood preservatives.While a steel safe might be the best choice, a locking metal cabinet will also provide a safe environment for your collection. Coin collections, along with the individual coins themselves, represent a fascinating glimpse into history, and preserving that history, along with your collection’s monetary value,is of critical importance. A properly maintained andpreserved coin collection will provide tremendous enjoyment as a life-long hobby, and as a great long-term investment for generations to come.